Frankly, there's little to update these days. I'm not feeling very well, been having a slight flu, and internet connection is unstable. The other day my bro was using the comp while it's drizzling outside, and out of nowhere, suddenly a bright light flashed outside and bang! a loud noise emerged from the modem. All the electrical appliances went out as the fuse is activated. And you know what's next lah, the modem is totaled. Thankfully, there's a spare modem which acts as backup. If not, I wouldn't know what to do at home in these boring few days. On Friday I skipped Physics & Applied Maths classes, sorry la I don't mean to skip Physics but it's just so "not-in-the-mood" to study especially during the holiday week. Haihz. During that week some of my friends go Japan la, Penang la, Malacca la, here and there. Damn I don't know when was da last time I get outta this neighbourhood, and have fun sumwhere else. And believe it or not, I've NEVER been on a plane before, not even once in my 18 years of living so far. So yeah, forget about Japan, forget about Europe. Not untill probably 5-10 years from now. And that's when work fo my own living. Anyway, to other things, I can't wait to buy FIFA 09. 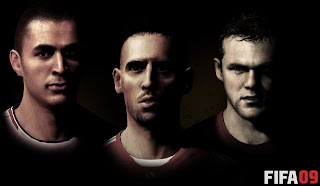 It's certainly the best football game of the year and clearly the best FIFA series ever. Mentioning about games, people might think I'm a person that don't play DOTA, especially the guys from college. Well, probably because the game is vastly played by those typical Chinese guys, which I'm not. I actually played that game alot during my Form2 & Form 3 years, but since Form 4 I started not to play it, and nowadays I dun play anymore because I don't feel addicted to it, and I prefer single-player games now. Since it's already 9.35PM now, I gotta get to bath and get ready for the Arsenal's game against Sunderland at 10PM. I'm a huge Arsenal fan if you don't know. And Cally, bout da tag thing, I'm gonna publish it up in the upcoming post, alright? ;).